OpenGL (Open Graphics Library) is a standard specification defining a cross-language cross-platform API for writing applications that produce 2D and 3D computer graphics. 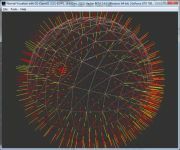 The interface consists of over 250 different function calls which can be used to draw complex three-dimensional scenes from simple primitives. OpenGL was developed by Silicon Graphics Inc. (SGI) in 1992 and is widely used in CAD, virtual reality, scientific visualization, information visualization, and flight simulation. It is also used in video games, where it competes with Direct3D on Microsoft Windows platforms. Objects handled by OpenGL are described as sequences of vertices (that define geometric objects) or pixels (that define images). OpenGL performs several processes on this data to convert it to pixels to form the final desired image in the framebuffer. FurMark, GPU Caps Viewer or Demoniak3D are good examples of OpenGL based applications. Page generated in 0.0040318965911865 seconds.